Emperor Pickletine Rides the Bus! Here is my Pickletine I made the day they announced the cover. I cut out the face, hands and lightning from a picture I printed out from the cover, but I folded the body and head. A community center near my house is having an art show, so I submitted an origami flapping bird and an origami surfer on a wave. They are now on display!!!! I’ll post pictures as soon as possible! 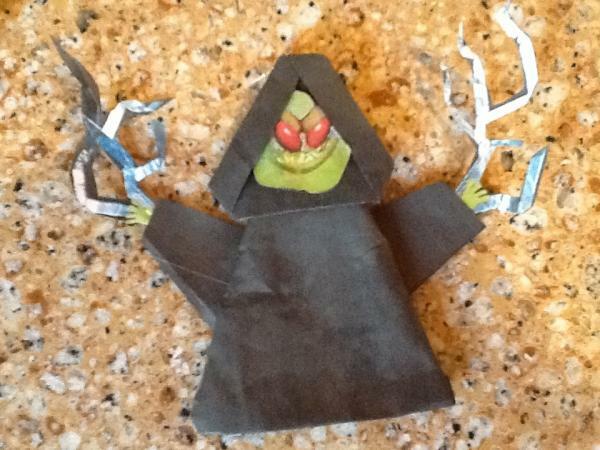 Here is my Van Jahnke Yoda I folded back during July. Lobot, Gonk droid, and treadwell droid. Welcome to RockHopper’s Origami! I will post my origami here. Enjoy!